Dirtbusters' staff enjoy a comprehensive training programme which includes National Training Awards and National Vocational Qualifications, and we are working towards Investiors In People accreditation. This ensures our people can provide you with the best service while working safely with machinery or chemicals (including compliance with the 2002 COSHH regulations) where appropriate. In addition to office cleaning and specialist carpet treatment, we provide floor cleaning: Concrete or marble, vinyl or parquet, from foyers to factories and from lavatories to laboratories. 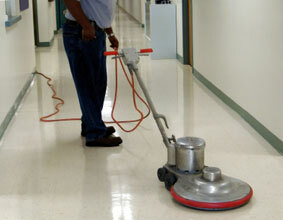 We clean and treat all types of floor surfaces professionally. Services include polishing, scarifying and vitrification. Window Cleaning Since glass is such a dominant feature of modern office buildings, we have made a speciality of commercial window cleaning, from single storey buildings to high access work. From making good on regular wear and tear to complete redecoration, we perform both interior and exterior works including the removal of graffiti. We offer a co-ordinated repair and maintenance programme which is particularly useful for commercial landlords, letting agents and property management companies. We also undertake shopfitting projects. The services of our skilled craftsmen can be included in a maintenance service contract as above, but we are also happy to undertake individual projects. Thanks to our trade connections, we can supply both consumable products such as toilet rolls, and non-consumables such as sanitary bins, at competitive prices. Products can be personalised with your company name and logo if desired.